Can't make it to New York to ring in the new year tonight? 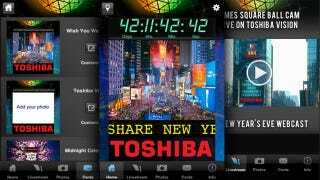 With the official Times Square New Year's app you won't have to plant yourself in front of the TV if you want to see the ball drop. The app was officially released a few weeks ago, and while it does feature a handy countdown until the year 2012, it really only becomes useful sometime just before midnight tonight. In addition to a live video stream of the famed ball dropping, you'll also have access to other content like the myriad of events and performances that serve as filler until the clock strikes twelve.